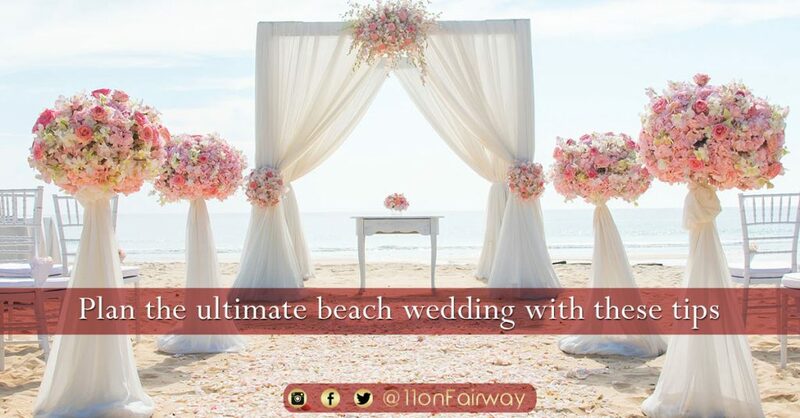 In this easy to follow guide we break down all the steps required for planning the ultimate beach wedding! If you have been dreaming your whole life about a flawless beach wedding, here are a few steps that will help make sure your special day goes off without a hitch. Make sure your guests know that the wedding is on the sand, so they can dress appropriately. This can be communicated with the invitation (included with the map/directions), on your wedding website and through word-of-mouth. Feet: Some beachy couples are providing a “shoe valet” where guests can trade out their Ferragamo pumps for casual flip-flops. Another nice touch is to have a de-sanding station—soft bristled paint brushes are a fun way to wipe the sand from between your toes! Eyes: Sunny days at the beach can be blinding, so make sure everyone knows to bring sunglasses, hats, or parasols—you don’t want them squinting at you the entire time! Weather: Remind your guests to bring appropriate wraps, in case it gets chilly. It’s not a bad plan to have sweaters, shawls, sweatshirts or even blankets on hand, should Cousin Ann show up without her pashmina. Alternatively, if it’s a high-noon ceremony in spring or summer, providing cool drinks (you can even order your own private-label bottled water, available from Innovative Marketing and paper fans (we love them printed with wedding programs) would make guests more comfortable. A beach wedding is not the ideal milieu for a formal ballgown or chapel train. Whether you opt for a tropical island sheath or a demure slip-dress, take advantage of the heaps of stylish fashions available to set a coastal mood. Light fabrics, such as sheer silks and chiffons, have a nice fluid movement to them, yet still look dressy. If you’re having a platform set up as a wedding aisle, then your satin pumps will be fine. Otherwise, consider sandals…or why not go barefoot? Find a pair of bejewelled barefoot sandals and you’ll look both dressy and casual. You can save your high heels for the reception. And don’t forget your own wrap—a filmy stole, lacy shawl or faux-fur capelet makes an elegant cover-up while keeping goosebumps at bay. Loose, flowing hair may suit your free-spirited style, but if strong breezes are a-blowin’, you could be battling strands in your teeth or curls sticking to your lip gloss. Instead, select a wedding hairstyle that has at least the front part of your hair off your face. Loosely arranged up-dos are also a lovely choice. Consider hiring a wedding planner that specializes in beach weddings. Their experience and vendor connections will save you tons of time—and money. For an intimate wedding of, say, 20 or so guests, it’s fine to have them gather around the couple during a brief ceremony. Otherwise, you’ll want to arrange for seating. Luckily, your setting is so picturesque that you won’t need to add décor. But an arch or chuppah makes a nice focal point. Be aware, most beach sites are public. Rain tends to visit tropical locales. Sometimes it’s the wind that makes things unbearable. Either way, Mother Nature is unpredictable so it’s best to always have a foul-weather option—a tent or indoor shelter—if only for your peace of mind. A special thank you to the amazing team at Here Comes The Guide for this informative article. We are sure our readers will absolutely love it!